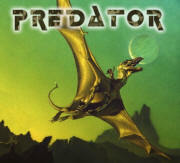 ﻿ The Official Website of "Predator" the heavy metal band! PREDATOR is an openly atheist North American heavy metal band with a large world-wide following. It was formed in late 2007 by founding members Damien Lee Thorr and Chris Reiser. They have had a few line up changes before establishing their current line up of Rick Mythiasin, Damien Lee Thorr, Billy "Goat" Gordon, Mike Heremana and Darrin McNair. Their self titled debut album was fresh out of the factory when it got signed to the Arctic Music Group label, founded by Scott Hecker, in Ft Lauderdale, Florida. Damien Lee Thorr later founded their own label, God Of Thunder Records and have since released a second album, Born In Blood. Their music is distributed world wide through MVD (music video distributors). PREDATOR is the hottest true "Power Metal" group that breathes new life into the commonly heartless boundaries of heavy metal. Their debut cd-dvd set is lightning packed within a collection of high energy thrashers that grab the listener from the first awesome slash across the strings. Their reality-based lyrics are deeply thought provoking works of poetry which will leave the listener feeling and thinking more about life on multiple levels. Their controversial song and video, "Closet Anti-Christ", an amazing metal anthem that addresses the topic of domestic battery, has been praised world-wide and helped them raise money for Women In Distress. Their hot new album, Born In Blood, is an awesome collection of metal gems showcasing their extraordinary talents and versatility, certain to satiate metal heads worldwide! Recorded in only 24 hours, Born In Blood captures Predator in even finer moments than their debut. This new album is relentless with power, might, and amazing musical creativity that echoes in one's head long after the first listen. 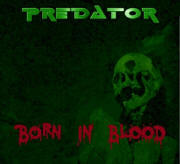 The future of metal is PREDATOR and Born In Blood is a masterpiece. Copyright © 2010 - 2014 Predator. All Rights Reserved.